A week ago I wrote about coal mining, using what is known as "Room and Pillar" techniques, which is the most common method of getting the coal from underground mines in the Untied States. However it can leave rather a large percentage of the coal in the ground, after mining is over. How do we get more of it out? The answer is known as "Longwall Mining" and that will be the subject of the post today. It is the method that is most commonly used in other countries to mine the coal, but to give you an understanding of how it can work, it might be useful to explain, as I did last week, a little history. This, for those of you who are new to the site, is a Weekend technical talk, where some of the underlying ways in which fossil energy is recovered are described. Earlier posts dealt with oilwell operations, and you can find where to find them at the bottom of this post. We're probably going to wander, via surface mining, in-situ combustion and CTL towards refining as the next few weeks roll by. Back in the mid-1800's underground mining was usually carried out by crews of men and boys, where the coal was first removed by undercutting the coal seam manually with a pick, to a depth of about 3 ft. The bulk of the coal was then broken down to this slot and the fragments (ideally about 4-inches in size) were shoveled and hand-loaded into pit tubs, to be hauled away. A good day's work was about 20 tubs. As the miners drove the tunnels (also called entries, headings, drifts, drives etc) into the coal they left pillars between the tunnels to hold the roof up. However in about 1870, and possibly in the Lancashire coalfield in the UK, they discovered that if they put these entries together, they could develop a way of getting all the coal out from that section (or panel). How could they get away with this? Well there are two things that make it possible. 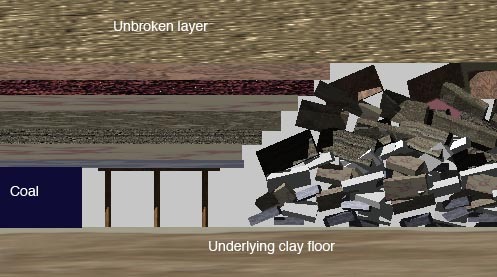 Firstly, when you make a hole in the ground, the rock pressure that was applied to the rock (about the same pressure as the depth of the hole) has to move somewhere. And it moves just a little so that the weight of the ground over the hole is carried by the rock on either side. However, what happens if this additional load is too high for the rock and it fails? Well if the rock were just a thin column it would collapse, but if it were thicker, then the weight would just move further into the coal. Now if we came along and moved the coal that had failed, then the hole would just continue to get bigger. But if we leave the coal in place, then the broken coal acts to confine the coal further into the solid. And this confinement gets higher, as the failing pressure continues to move into the wall. And what happens is that this confinement builds up the strength of the coal, so that at some distance into the wall (or face) the coal strength reaches a point that it can carry the weight of the ground above the working area. (For a simple analogy think of a deck of cards, which individually cannot bear weight, but when held together by a rubber band, or a carton, can support quite a bit of weight). The second thing to know is that when a layer of rock breaks the rock lumps when piled together occupy more space than the solid rock. As a rule-of-thumb the bulking is about 60%. 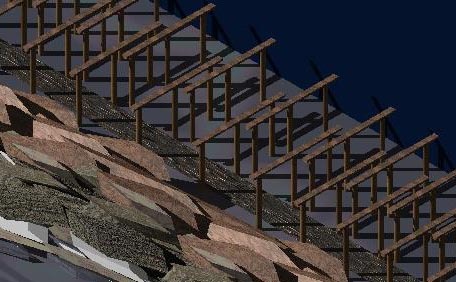 So that if we let the roof over the working area break and collapse, after we have taken the coal out, then by the time about twice the seam height of rock has collapsed, it has filled the hole where the coal used to be, and reaches up to the solid layers of rock above, to hold them in place. The confinement of the rock around each piece allows it to regain some strength, and so collectively the broken rock behind the working face (called the goaf or waste) will carry the weight of the ground from about twice the seam height, all the way to the surface, and with the other end of the "bridge" as it were resting on the confined coal ahead of the working face. (While the width of this bridge varies with depth, coal and rock strength etc, for an initial estimate you can imagine it as being around 500 ft). Now, to get the coal out it was possible to put in mechanical assistance. The first step was to use a machine, rather like a large chain saw, that was pulled along the face, undercutting the coal, to give that first free surface. At the same time holes were drilled along the face, about 6 ft apart, with a stick of dynamite in each one. After the face was cut the coal was blasted down between shifts (7.5 hours) then the collier shift would come in and each man would have about 10 yards of face to load the coal from, and to re-support. To get the coal from the face, a rubber conveyor belt was run along the back end of the supports that were in place before the blast, and the coal would normally not break that far from the face. As the miner shoveled he would also put in a new set of timbers, overlapping the old, and supporting the new working area. Typically this would take another seven hours, with an ideal seam height being about 4.5 ft. Above that the coal volume to move was much greater, and below that it got a bit awkward. For example, below 2 ft thick you lie on your back, with a prop under your shoulder and shovel over your head - how would I know? Yes, there was a reason to go to college). In the third shift, the men would come in and break down and move over the conveyor belt, and then remove the last row of wooden supports, bringing the roof down, beyond the new line of supports. (Smart folk would use a come-along and a chain to pull down the props, young idiots (guess who) would go in with an axe to chop them first). The process needed mechanization and this required three different components to work. And these all came together in a period around 1960 - 65. Firstly there was a better way of removing the coal. The machine that was developed initially took the coal cutter power pack, and turned it on its side. By then putting a drum with picks on it, over the shaft to replace the cutter bar, the Anderton shearer was invented (named after its inventor). The drum rotated, and a shaped cover behind it moved the broken coal over onto the second part of the process. 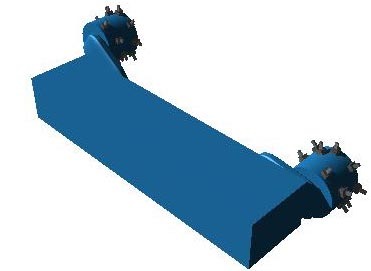 This is a rigid framed conveyor, made up of segments that can move against one-another, and with rigid metal walls. The shearer can ride either on top of, or along side this conveyor, and load the coal onto it. The conveyor then carries the coal to the end of the face, and onto a second conveyor, that carries the coal out of the panel. 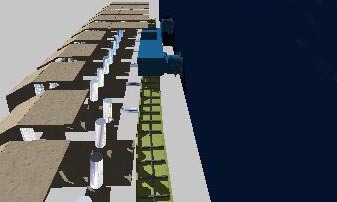 It is the third part of the concept that makes the whole system viable, because we now add the powered roof support. These are sets of hydraulic rams that ride on one plate of steel, pressing a second up against the roof. They are connected to the conveyor by a horizontal ram. The mining process is thus that first the shearer moves down the coal face, grinding off the coal to a depth of around 2 ft. After it passes, the rams on the roof supports, in turn, are released, so that they drop away from roof contact. The horizontal ram is retracted and the support moves forward until it contacts the conveyor. It is then raised, and re-supports the roof. Each support moves forward it turn, so that the miners (which now include women) are always under a roof of steel. 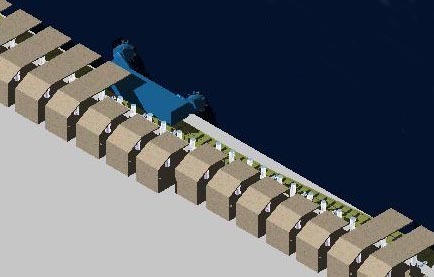 After the supports are re-established, the horizontal ram extends, pushing the conveyor over into the open space where the coal has just been mined. The exposed roof rock then collapses into the open space behind the back of the supports. I have taken away some of the canopies of the shields so that you can see the conveyor snake after the shields move forward. The view closer in shows the conveyor and supports better. 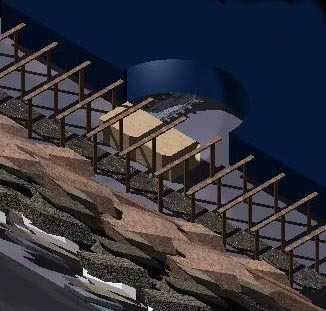 Because of the way the roof rock weight distributes, it is usual to drive entries out to the edge of the panel first, and then mine back to the main drive tunnels, rather than mining away from the mains. In part this is to keep the excess weight from acting on the tunnels the miners travel through. Over time the ground movement works to the surface, and the surface of the ground will drop, by some significant percent of the height of the coal removed, since the rock in the waste will crush and consolidate. This is called subsidence, and if the mining is carried out badly, then it can cause significant damage to surface buildings. However, if done properly, it should not. I will cite two examples of the latter. Firstly in the height of mining and before North Sea Oil and Gas, Britain mined coal at a high rate of production, from where it was found. This included under the city of Coventry, which was at the time home to large manufacturing plants, with precision lathes. By back-filling behind the face props with the blown-in waste from the colliery treatment plant (called stowing the goaf), the waste was filled, and the ground movement minimized to the point that I only heard of one factory being closed for less than a week to realign their lathes. The second example was in Duisburg in Germany, and a different problem. The town is a port on the Rhine, and over the centuries the river had eaten into the bed, so that the quays were becoming too high above the water for easy loading of the barges, and the town was losing business. They went to the local coal company and asked them to mine out seams under the harbor, and thus to lower the quays to bring them back in reach of the water. The miners complied, and lowered the area by over 11 ft. The area that was mined included highway overpasses, and a Shell oil storage facility in the middle of the river. The story goes that the tank farm manager went to the miners and asked them to tell him when they were going to start, so that he could drain the tanks as a precaution. They pointed out that the farm had actually already been lowered about 3 ft, as I recall the story. As usual this has been rather a superficial description of a process, but hopefully it gives you more of a sense as to what goes on underground. I am girding myself to talk about surface mining next time. Further since, as I mentioned, the illustrations were taken from 3-D models I have build, if a different view would be more useful also please let me know. (It also explains why these are a little slower to come out than they used to be). Have any mines used coal ash as a backfill material? The elimination of surface ash landfills would appear to be a plus. I don't know of any, off-hand. Cost was a major factor in using the material from the coal preparation plant, since it was close at hand and generally small enough in size to pump to the working area. If you don't mind me asking, when were you working in the mines? I'm a 20 year old (college) student and I was wondering when ponies would still be used in mines. As enjoyable as the tech talks are, I would also be interested in learning more about what it was/is actually like to work in a mine, from a more personal perspective. I worked in the mines in the early part of the 1960's, but pit ponies have been used until fairly recently in the UK, and I would suspect still are used in some countries. Every mine is different, I was fortunate in that most of those I worked at were quite warm and dry, but my father worked one that was very wet, and, being shallow, also cold. But in most mines in the US there is enough room to walk upright, and they tend to be quite comfortable as long as you don't have claustrophobia. Most miners are also very friendly and tend to work together well. The last pit ponies to work in British Coal's deep mines were retired in 1994. There are a number of claims for the very last one. One claim is for Flax, a grey Welsh Mountain pony, was brought to the surface for the last time in February 1994 from a Nothumberland mine. A few were employed in small privately owned drift mines for a couple of years after that. The deep mine ponies lived underground. In drift mines the pony would haul the coal to the surface. Seems to me that the same trains which deliver coal to the users could carry ash back to the mine. Does the step from Room and Pillar mining to Longwall Mining and beyond (is there a beyond) decrease the EROI of what you get out? I know that Gevers in Beyond Oil projected that lower quality coal and higher energy inputs would result in a coal energy profit ration of .5 to 1 by 2040. Is the amount and type of coal and mining subject to law of diminishing returns more dramatically than that of oil? I am thinking I might do a post on coal quality and dirt and the need to clean coal, etc, in a couple of weekends to discuss this, since it is not a simple answer. Mining museum in Helper, UT has a neat explaination of long wall mining. Ditto the Museum of Science and Industry in Chicago. That is a truly amazing process. I had no idea it was done this way with the controlled collapse of the roof.